This special had various writers and artists. For the sake of this review, we will be concentrating on the two Superman centric stories. Superman and Batman are fighting a rainbow colored monster in Quito, Ecuador on Christmas Eve. Superman battles the monster, and manages to destroy him, while Batman stands around giving directions. The two heroes talk a little afterwards, before Superman flies off to track down an interactive video game that Jon wanted for Christmas. Batman mentions that Damien also wanted one, but they're all sold out nationwide. Back at the farm, Jon talks to Damien on the phone, as he sits and watches other kids play in the snow. Damien on the other hand is out as Robin, taking out some weird colored thugs. Meanwhile Superman circumvents the country trying to track down the video game with no luck. All the while stopping various crimes along the way. He finally manages upon a store that may have one, but finds that he is too late, as the last one has just been sold to none other than Damien Wayne. Later that night, the Smith's (really Clark, Lois and Jon) enjoy the company of Bruce Wayne and his son Damien, as they finish Christmas Eve dinner. Afterward, Damien mentions that it's time for presents, and Jon runs into the next room to get started. Clark attempts to tell Jon that he is sorry that he couldn't get the game he wanted, just as Jon opens a present addressed to him. It's the game he wanted, gifted to him by Damien. Clark asks Bruce if he knew that Damien was going to do that, to which he reply's "I'm the world's greatest detective, but no I did not". The boys get started playing the game, and Bruce and Clark have a chat outside, about what a good gesture Damien did. Story - 3: It was a very charming but very predictable story. It really reminded me of the Arnold Schwarzenegger movie, "Jingle All The Way". Tim Seeley is usually a really good writer, but here he seemed like he was dumbing the story down. Batman felt like a real pompous idiot, in his dialogue at the start, whilst Superman seemingly destroyed the monster. This left me confused, did he kill it, or was it never really alive? Maybe I'm nit-picking, or maybe it was just lazy writing, you decide. Not much else to say really. I don't think it will win any Eisner awards anytime soon. Art - 5: I love Ian Churchill's art. His style has remained consistent throughout the years, and he has proven that he is good at inking his own pencils. Churchill managed to make the costumes look really good, as well as their civilian clothes too. I loved the matching sweaters the Kent's had on at dinner. It was a nice touch. Also love the panel that is shaped like Superman's ear, clearly indicating that Superman can hear all that is going on. The art was the better part of the story for me. Pretty much the only saving grace. "For The Dog Who Has Everything"
Almost carrying on from where the last story left. It's Christmas in the Kent home. Jon curiously asks his parents if Krypto would realize that he is not a normal dog like the others on Earth. That he is far different. Lois mentions that it has been a stressful year for Krypto, especially with the whole Eradicator fiasco. Superman takes Jon to the Fortress of Solitude, to find a special gift for Krypto for Christmas. There, he explains to Jon just how he felt when he first became Superman, and what it was like putting the costume. He goes onto explain how he hadn't come to terms with being a Kryptonian, or being a human being for that matter. All he knew was how to be himself, which turned out to be more than what he needed. Jon feeling inspired by Clark's words, has an idea for a Christmas gift for Krypto. They take Superman's belt from his old costume, and fashion it into a collar for Krypto. Story - 5: I liked this story very much. It is definitely a tale for Superman and dog lovers alike. I liked the lesson it was for Jon, in accepting his heritage as both Kryptonian and human. All the while, being himself, and staying true to that. This story spoke to me on a personal level, as I felt the same thing as Clark did, as I was growing up. I had to learn, understand and accept my own heritage and culture, while staying true to myself too. I loved this story, thank you Eric Esquivel. You did a great job sir. Art - 5: Jurgens definitely belongs on the Mount Rushmore of Superman artists. Solid pencil work, and great pacing. I have always loved his Superman, and it was a real treat in this short story. I love the details of the Fortress, where we see the more iconic pre new 52 suit, as well as the Lois and Clark black suit, and the All Star Superman, white solar suit. The belt as a new collar for Krypto was a nice touch. The rest of the Holiday Special was pretty good. Nothing really jumped at me like the Krypto story did. Worth mentioning are #1 the wacky Detective Chimp and Batman story. 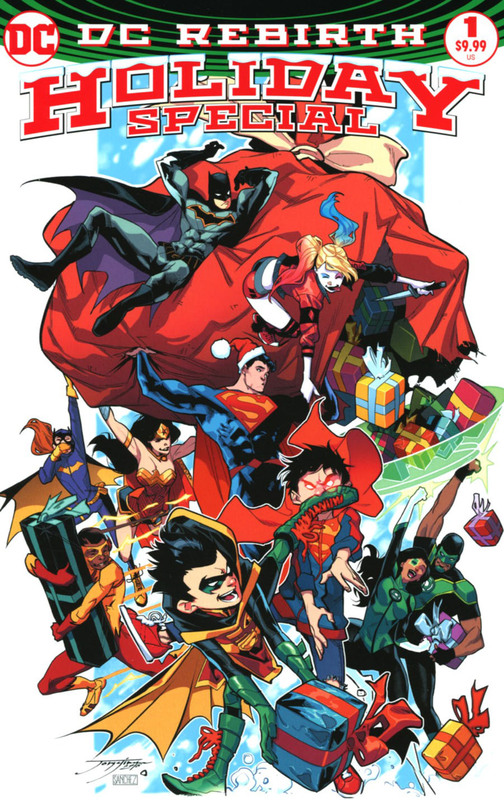 And #2 the Titans New Year story focusing on Roy Harper. Not the most traditional of Christmas and New Year tales. But it was good that the writers tried to be inclusive of the more diverse traditions and customs of the characters of the DCU and the world. Cover Art - 5: I love Jorge Jimenez art very much. And I love this cover. Superman looks great, but I love that Jon and Damien are front and centre. Especially since Jimenez will be handling the art duties for that book also. Fantastic colors by Alex Sanchez also.